urban sprawl n. The unplanned, uncontrolled spreading of urban development into areas adjoining the edge of a city. The above definition could be easily applied to the state of my desk…perhaps even my life! I pitch and purge, as you read here, and within weeks… no, days…it looks like the above jumble of gunk. The actual things ON my desk are all quite important: materials for teaching, latest yarn projects, both finished and in progress, art books, a pile of the stuff we get from three different schools (high school, middle school, elementary school), photos of family, my ukuleles and bag. There is maybe a 12″ x 12″ square in the middle of it all free of stuff. Oh me…it’s dizzying just looking at it. Time for pitching and purging once again. Or maybe just a little better organization. Or maybe an ability to say NO. Or…….got any ideas?? BTW~the bookshelves in the painting appear empty…HA! They are stuffed to the gills! I just couldn’t bear to draw all the baskets, books, and stuff which feed my creative self. 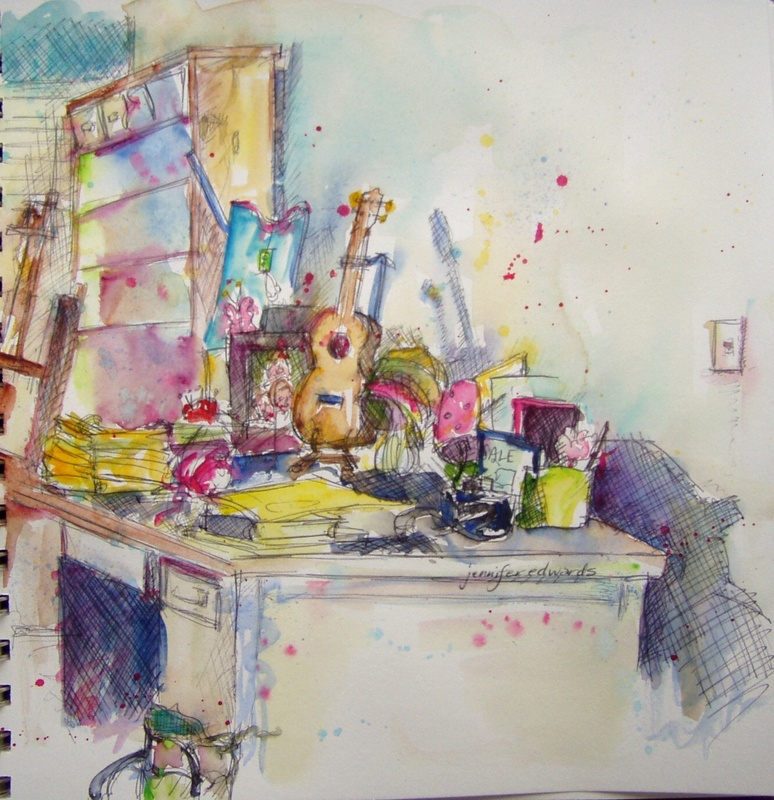 I’m beginning to believe that “clutter sprawl” is a normal condition of a creative life. BTW2~the wall above my desk was empty when I drew this, but has just come home from the exhibit at AAWS! Perfect for that space! BTW3 ~We are at 120% of our goal at the time of this posting!!!!!! Yippee!!! A huge thank you to all who have so generously given to JDRF in honor of our daughter Maddie! You all are AWESOME! In case you’re wondering…we will continue receiving donations up until the walk day, so it’s not too late to contribute. Who knows, we might even double our original goal!! That would be cool! If you need the easy-peasy link, here it is! Love your painting. Have you ever thought about adding online painting classes to your busy life? My desk looks like this too. I’ve gotten so crazed by it I have gathered up my books to take to the library. I told my husband I am purging 90% of my books and he can’t really believe it. I will fill the truck bed! It feels so good to be getting rid of something but I hope I don’t regret it later. I just can’t handle the clutter right now. So long story short: I do understand the over-cluttered feeling you have. Hmmm…I’ve never thought of that. I just might look into it. Maybe when life slows down a bit:) But thanks for the suggestion! I don’t even know what classes online entail: is it an interactive thing? or like a 45 minute class you, as the student, observe and can start and stop as you like? Anyway, thanks for the idea. They are done both ways. I like the classes that have a definite start and end to them but others like access to the material forever once they’ve paid. If you ever consider it be aware of one thing: sometimes people take the videos and “share” them with everyone. That’s why some try to use a site where they cannot be copied. My favorite so far have been Laure Ferlita’s Imaginarytrips.com She uses a blog for the classroom where we post lessons, get feedback, ask questions and see each other’s efforts; Vimeo for the videos and then we also get a PDF to print or save. Most classes are interactive in some form but some that go on at your own pace lose much of it. I learn as much from seeing others’ work as from my own so I prefer the really interactive. It’s not clutter it’s a busy creative life on a desk! Love the painting. I’m really hoping it is the first BTW. It would make me feel so much better about the pile of stuff that always surrounds me! Lovely sketch! I like your festive, jaunty urban/desk sprawl! I know the feeling!